The Virginia Uranium Working Group tasked with proposing guidelines for how the country’s largest known uranium deposit should be safely mined has issued its report. The report notes that if lawmakers lift a permitting ban, there are still many steps before uranium mining would be a reality in the state. The group is made up of staff from Virginia’s Department of Health, Department of Environmental Quality, and Department of Mines, Minerals and Energy. The group studied the issue for nearly a year and held several public meetings. Its report explores what a regulatory framework could look like if the General Assembly were to lift a 30-year moratorium on uranium-mining permits. The report, to the state’s Coal and Energy Commission, offers guidance on monitoring the air and water that would surround a uranium mine as well as the health of miners and residents. Suggestions for staffing agencies that could be involved in overseeing the mine are also included. To cover the cost of regulation, the group recommends permitting and licensing fees and a possible tax on the mining companies. The report does not advocate for or against the issue or compel lawmakers to take action — the group was not asked to take those positions — although the commission is expected to make a recommendation before the start of the legislative session in January. In 1982, state lawmakers banned permitting pending the creation of regulations. Gov. Robert F. McDonnell (R), who created the group in January, said he will meet with stakeholders and review public comment before weighing in on whether the ban should be lifted. 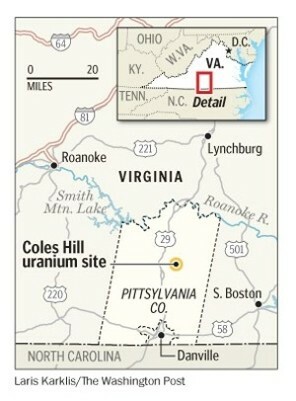 In the late 1970s, uranium was discovered in south central Virginia. The site at Coles Hill, in Pittsylvania County, sits on land used to produce cattle, hay and timber. The deposit is believed to be the seventh largest in the world: enough to supply all U.S. nuclear power plants for about two years or satisfy Virginia’s demands for 75 years. The uranium deposit, 119 million pounds, is worth an estimated $10 billion. Supporters say that lifting the ban would tap a homegrown energy resource, respect private-property rights and create jobs in an economically depressed region of the commonwealth. But critics say mining has significant health and environmental risks that outweigh economic and energy interests. In 2007, landowner Walter Coles established Virginia Uranium, and the company has lobbied aggressively to lift the ban. As part of its push, the company spoke to more than 100 legislators and flew more than a dozen of them to France and Canada to visit uranium mines. Virginia Uranium’s efforts were stalled in January, when McDonnell asked the General Assembly not to lift the ban during the 2012 session and instead called for the study. In his order, McDonnell set a deadline of Dec. 1 for the group to present its findings.